When I was a child, Lassie Madden was the end all and be all in my life. Not once did I ever feel unloved or unwanted as she encouraged me to strive to be all that I could be. But, she was also a stickler for rules, lots of rules, and her children were expected to act accordingly. There were chores around the house, good grades to achieve, bedtimes to adhere to, and the admonishment to call (or else) when we made it to our final destination. But the worst was her nagging about morals, being kind, and living by the Golden Rule. Thanks to her, my childhood was rather uneventful. I missed out on shoplifting, toilet papering the neighbors, cheating on tests, and never experimented with drugs and alcohol. Continuing to watch the woman I loved most in the world breathe short, shallow breaths, my giggles over what I’d once perceived as problematic suddenly dissolved into tears. It was evident that doubt was searing her self-confidence with its burning flame. Mom’s time was drawing near, and she knew it. She was searching for solace with the most important role in her life: motherhood. How I wanted to reassure her that she was loved beyond compare. Instead, I gently brushed the wisps of hair off her face as she drifted to sleep. It’s been fifteen years since that day. Shortly afterward, I became a girl without her mother. How I still miss her. I’ve often likened our story to that of “The Velveteen Rabbit.” Like the child, I adored her beauty and softness, never disbelieving that she wouldn’t be there to cuddle whenever I needed it. Wherever she went, I went, holding tightly to her hand. But, as she became tired, threadbare, lumpy and misshapen, I found I loved her even more. Although she tried to be an exemplary role model, Mom was never perfect. She became frustrated often, even angry at times, and cried over her admitted failures. As a child, she was Super Mom with her shiny red cape and flaming crimson curls, but as we both began to age, I saw her as so much more: Mom was human. 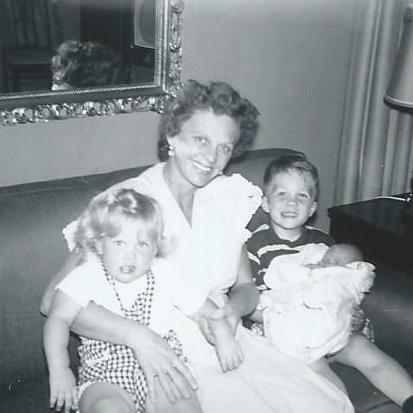 If Mom were here today, I’d tell her I loved her because she didn’t always make everything sweet for her children. She taught us that life can sometimes be difficult, even painful, but despite it all, it was still a gift and something to be treasured. Because Mom lived without pretense, open and honest, I learned to be patient with my flaws as I watched her manage hers. Her authenticity broke down all barriers in our relationship so our love could cross with no doors to the heart closed. She allowed me to love her, really love her inside and out, and for that I’d tell her, again, she was the best mother a girl could have. Such a beautiful warming article! I am sure she is up there feeling very proud!